This pasta dish (pictured above) is hearty and full of flavour, and if you do the prep at home, it's incredibly simple and streamlined. Basically, you cook the sauce down until it’s a thick and chunky texture, then pour it over cooked spaghetti (or whatever pasta you have available). I made breadsticks over the fire too, but if you know there’s a fire ban or don’t want to attempt it, just bring a baguette or a salad for the side. I made this version with ground turkey to keep it lean, but you could use tofu (drained well), ground round, pork or beef. Heat pot to medium high and add tablespoon of oil. Add chopped onions and celery, as well as garlic, cooking for 4 to 5 minutes. Add ground turkey and begin to brown, breaking up into small chunks with a spoon. Add some salt and pepper. Browning should take 8 to 10 minutes. Add tomato paste and cook for 2 more minutes and then add wine. Cook gently for 3 to 4 more minutes and then add the crushed tomatoes, oregano and basil. Cook on medium-low until the sauce thickens and reduces—it can take anywhere from 50 to 90 minutes, depending on how thick you want the sauce and how strong the stove is*. Taste and adjust seasonings as needed. When the sauce is almost done, cook the pasta, drain, plate and then top with the sauce, green onions and optional Parmesan. *My camping stove kept going out in the wind, so I put the pot above the fire to reduce it and because of that, it took much longer to cook, around an hour. If this happens, make sure you rotate the pot and stir often. 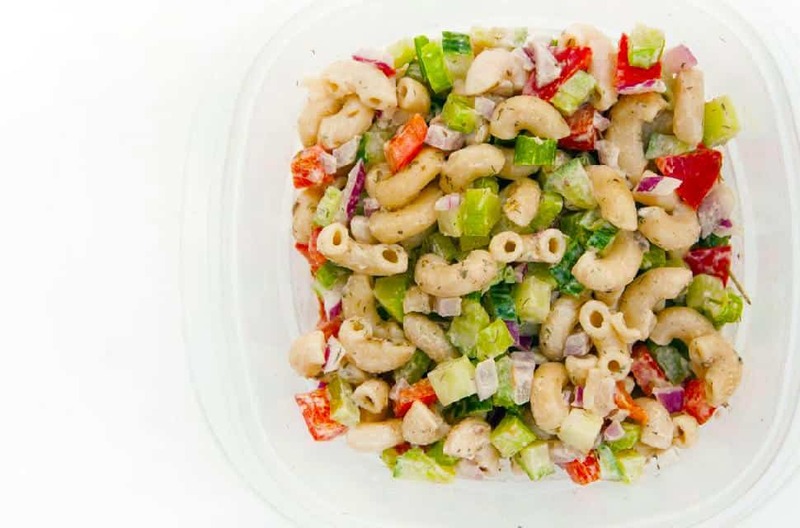 This pasta salad is easy to prep at home and make on the campsite. 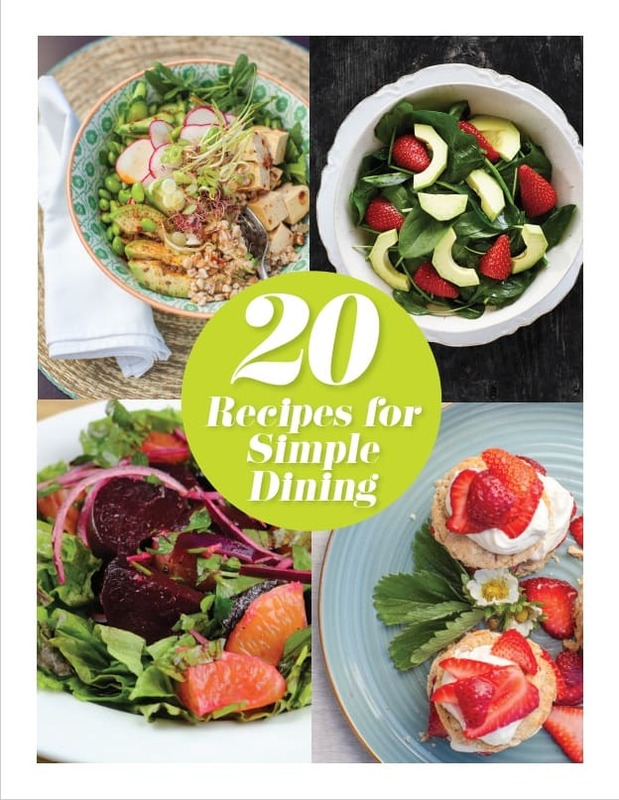 Plus, the dressing is simple—and vegan, too. You can enjoy it as either a main for lunch or as a side for dinner, and it pairs really well with BBQ. Chop pepper, celery, cucumber and onions and combine in bowl. In a separate small bowl, mix seasonings and mayo together. Adjust as needed. Add pasta to veggies and mix with dressing. Place in cooler until chilled and then serve. Makes enough for two lunches, or 4 to 6 servings as a side dish for dinner. This is an easy lunch and you can use the leftover chickpeas to make roasted chickpeas on the BBQ or fire. Chop everything at home to save time and space at the site, and mix the spices, putting them in a baggie or Mason jar so there’s no measuring involved. 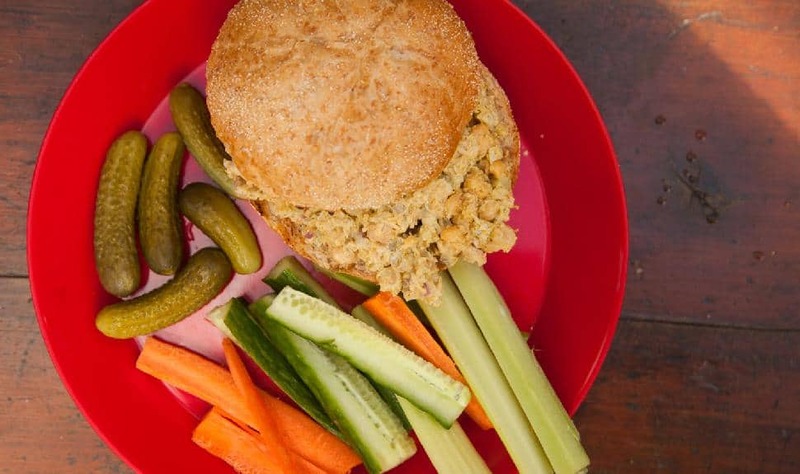 Throw some veggies and pickles on the side (you can chop a pickle and toss it into the mix if you’d like), toast your whole wheat bun and you’ve got a hearty lunch that will fuel you for any outdoor activity! Drain chickpeas and pour into bowl. With a fork (or wrap a rubber mallet in plastic), crush chickpeas until they’re chunky but not puréed. Add spices, celery, red onion, and mayo, and combine evenly. Optionally toast your bun on the BBQ (or fire, carefully), and put the sandwich together. Serve with vegetables and/or pickles.